The cable I ordered - a fibre-optic sorround sound cable - came through in just two days. They were in, installed and operating on day 2! On the same day that I ordered the fibre optic audio cable from Cable Chick, I also ordered a pair of MIDI cables from another supplier in Canberra. These arrived four days later. The follow up and order confirmation from Cable Chick was simply perfect. Thanks for everything. Ultra Low-Profile LED TV Wire Mount System (50kg) + FREE SHIPPING! Do you want to hang a super-slim LED screen just like it was a family photo or a framed painting? With this Ultra Low-Profile LED TV Wall Mount System, you can do exactly that - and at a bare 20mm off the wall! Quite frankly, I was surprised when these rocked up at the warehouse because the boxes are so small - but that's the whole point; they've boiled the elements of all mounting brackets down to the bare essentials, but what's even more incredible is that the system can still support a hefty 50kg weight - way more than most LED screens! It's compatible with screens that have mounting points 400mm to 800mm apart (centre to centre) regardless of manufacturer. The wire included is 820mm from bolt hole to bolt hole, so the vertical mounting height of your TV can change depending on the silver disc spacing at time of installation. You also get the added convenience of a kick-stand for getting access to cables. The package includes a good set of spacers and screws for brick and stud installations, so all you need is a screwdriver, power drill and some DIY know-how. Don't forget; with only 20mm of clearance between the wall and the back of your television, the power and data inputs will need to be down- or side-facing or your screen won't sit flat. The profile is so low even our right-angle adapters might not be of any help! VESA 400 Tvs need at least 100mm of clearance between the top bolt holes and the top edge of the screen to effectively hide the wire and mounts. Measure up first to ensure a tiny installation. Screen Size: Up to 60"
Recommended for televisions and monitor screens under 60"
*Stud spacing between 580mm and 620mm recommended for VESA400 TVs. Alternatively, studs can be spanned with a nicely dressed/painted piece of timber the size of your TV to ensure the mounting discs can be installed anywhere. Answer: "Generally not. It will depend on the TV manufacturer - if your curved TV has a curved back, then regular VESA TV wall mounts will not be suitable. If your TV is curved on the front but flat on the back, then these mounts should be compatible if the other specifications match." Answer: "Yes. 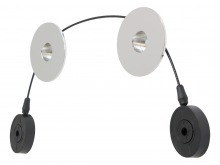 This mount similar to the WMN1000B mount from Samsung, but allows for compatibility with other brands and sizes of TV as well (the wire is much longer). Following the diagrams on our website and in the bracket's install guide should achieve a secure installation." Answer: "Provided your panel is under the weight limit and has bolt holes within the specification for this mount, it will be fine to use on a 65" panel. Larger screens' top edge may touch the wall when trying using the kickstand, depending on the design of the TV."